CONTACTOS offer the opportunity to alternate the culture with the rest, the sport or the adventure. 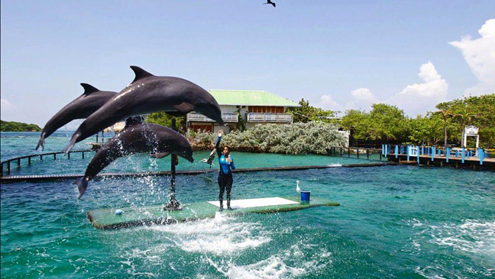 Their programs include the enjoyment of beach days, ecological walks, water sports and mountain, horseback riding, amusement parks, and activities for all ages and all tastes. Here below you can find a selection of tours; CONTACTOS will have more options to suggest you onsite. Panoramic tour in air-conditioned bus or van through the residential neighborhoods of Bocagrande, Castillogrande and Manga. Guided visit to San Felipe de Barajas Castle, the most important military monument of Spain in America and which protected the city from pirate attacks. At the end of this visit, transfer to the historic center by the Santander Avenue where you can observe the ramparts and walls that surround the historic center. Visit to Las Bóvedas artisan center and guided walk through the historic center of the city. The tour ends with a visit to the church of San Pedro. Includes: Bilingual guide, entrance to Castillo San Felipe and other sites mentioned. Note: Access to the monastery of La Popa is restricted indefinitely. Once the access to the monastery is permitted, we will add it to the City Tour itinerary. Activity Schedule: Monday to Sunday. Daily departures at 14:00 hrs. Meeting Point: Pick up at the hotel lobby indicated by the client. Pick up at your hotel in air-conditioned bus or van, to take you to the historical center of the city. Guided walking tour where you will have intimate contact with history. You will be able to admire the Gold Museum, The Inquisition Palace, The Aduana Plaza, Los Coches Squares, Bolivar Park, San Pedro Claver convent and all the colonial and republican architecture reflected in its houses. Includes: Bilingual Guide, entrance to the Inquisition Palace and Convent of San Pedro. Activity Schedule: Monday to Sundays. Departures in the following Hours: 9:00 - 14:00 -15:00. Meeting Point: Lobby of the indicated hotel or main door of the San Pedro Church. 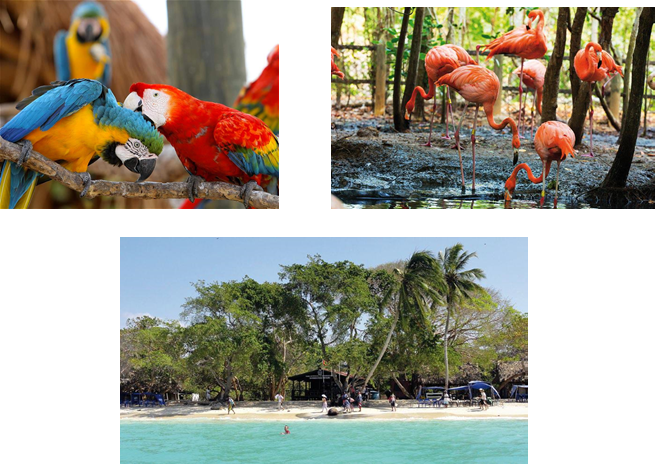 The National Aviary of Colombia is located in Baru, an island located 14 Km away from Cartagena. The National Aviary is divided in 20 zones as the Flemings Lake, Swan Lake, desert area; tropical, dry and moist forests; Rocky Mountains, among others. It houses 135 species and 1800 birds, of the 5,000 they aspire to have. At the end of the tour you can see a large lake where swans and ducks from several countries live, making this a perfect sample of the biodiversity of Colombia, demonstrating that we are the country with the greatest variety of bird species in the world, with 1,850 species. At the end of the visit to the National Aviary, we will visit to the sector of Playa Blanca, where you can enjoy a typical lunch and have a beach bath. Includes: Transportation, bilingual guide, entrance to the National Aviary, 2 hours in Playa Blanca, typical lunch. Activity Schedule: Monday to Saturdays. Departure at 8:00 a.m.
Meeting Point: Pick up at the indicated hotel. Observations: Rates don’t apply to passengers staying in the Manzanillo area. 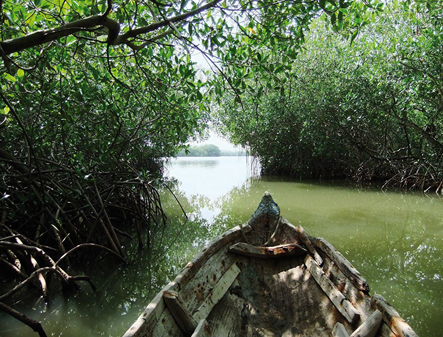 Departure from the hotel of stay, to carry out an interesting journey through the mangroves and then visit a mud volcano located 50 minutes from the city of Cartagena. Includes: Bilingual Guide, transport to Totumo Volcano, bath in mud volcano, typical lunch, mangroves tour, entrance to the Pre-Colombian Museum, transfers. Activity Schedule: Monday to Sundays. Departure at 08:30 hrs. Meeting Point: Pick up at the hotel indicated by the client. Observations: Passengers staying in the Manzanillo area must travel on their own to a hotel in Bocagrande to take the tour. 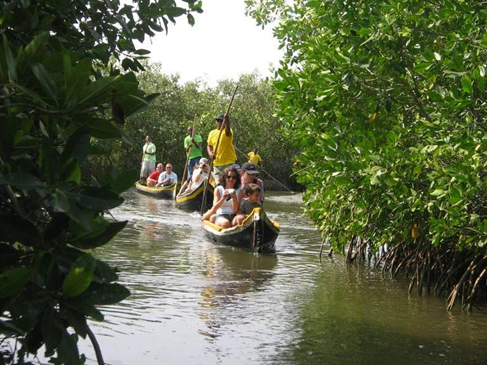 Exotic tour through the mangroves located in the Cienaga de La Virgen, rescuing the ancient route of the Spanish conquerors during the seventeenth century, a tour through canals and natural tunnels, visiting early lime kilns and shad hatcheries (Representative fish of the region) and an archaeological park with replicas of multiple pre-Colombian cultures. Includes: Bilingual guide, transfer from the hotel of stay to Manzanillo del Mar, transport in Palanca Canoe, Mangrove Tour, entrance to the Pre-Colombian Archaeological Park and return to the hotel. Activity Schedule: Monday to Sundays. Departure at 1:00 p.m. 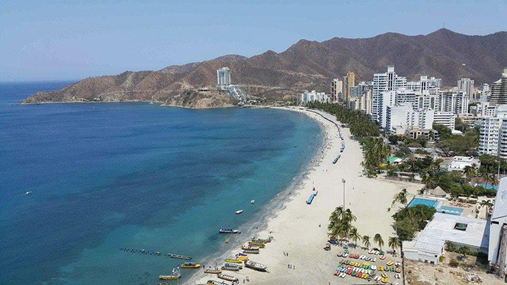 Pick up at the hotel of stay, to take a tour to Santa Marta on a bus or van with air conditioning. On our way to Santa Marta, we will make a stop in the city of Barranquilla, a panoramic tour and stop for breakfast or snacks. The route continues to the city of Santa Marta. Panoramic tour of the old city of Santa Marta and visit to the Quinta De San Pedro Alejandrino, house where Simon Bolivar died. Visit the monument of best football player in the country "El Pibe". Free time to enjoy the beach in El Rodadero. Typical lunch. 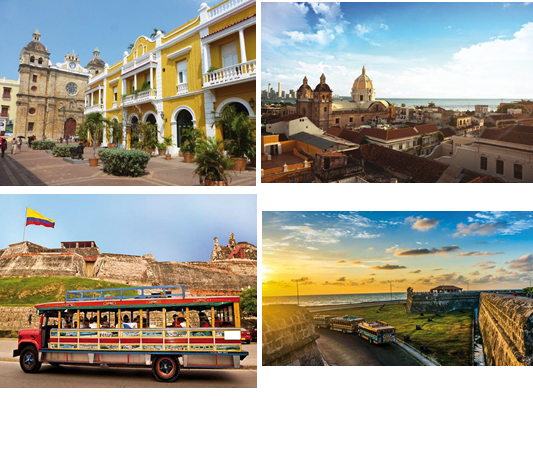 Includes: Bilingual guide, Cartagena / Santa Marta / Cartagena transfers, typical lunch. Activity Schedule: Departure Wednesdays and Saturdays at 06:00 hrs. Sport Barú Hotel is located in one of the best places on the island of Barú: the Cholón bay, 45 by speedboat from Cartagena de Indias, and only 15 minutes away from the Rosario Islands. 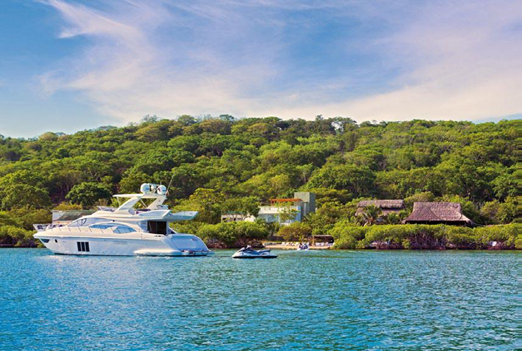 It’s the perfect place to practice water sports such as kayaking, sailing and water skiing. You can enjoy ecological walks next to green hills or practice Snorkeling and diving. Includes: Main Dish: Typical lunch with fish consommé, fish fillet, with coconut rice, fried plantain, salad, dessert and 1 soft drink (water, juice or soda). Activity Schedule: Monday to Sundays. Subject to meteorological conditions and authorization of Harbor Captaincy. Departure at 8:20 a.m.
Meeting Point: Marina Santa Cruz in Manga. 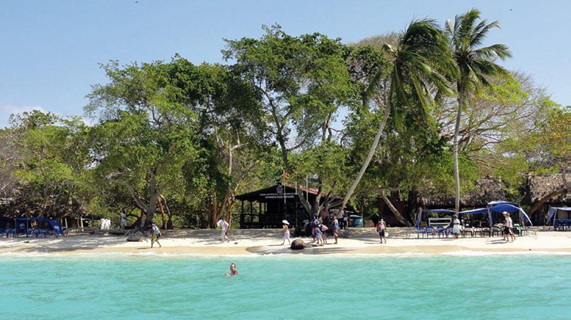 Visit to Playa Blanca, one of the most beautiful beaches in Cartagena, located on the island of Baru. Playa Blanca is an important place to visit during your stay in the city of Cartagena, where you can enjoy crystal clear waters and excellent landscaping to take photographs. Includes: Roundtrip transportation in air-conditioned bus, snack, typical lunch at Playa Blanca (Fish / chicken, coconut rice, fried plantain, salad, juice). Not included: Meals and drinks not specified in the plan. Activity Schedule: Monday to Sundays. Departures at 08:00 - 11:00 hrs. Full Plan Includes: Pick up and return to the hotel, transportation by speedboat, tour of the 27 islands, stop at the Aquarium, open bar 1 hour, 5 lunch options (roasted meat, roasted breast, mixed roast, fish fillet, fried mojarra) all accompanied by fried plantains, salad, portion of rice and 250 ml soda. Simple Plan Includes: Pick up and return to the hotel, transportation by speedboat, tour of the 27 islands, stop at the Aquarium, typical lunch. Not Included: Departure and Coralina Tax approximately $16,500 COP per person paid at the departure dock. Entrance to the Oceanarium: Approximately $ 30,000 COP adults - $25,000 COP children (4-11 years). Activity Schedule: Monday to Sundays. Departure at 8:00. Observations: For the passengers located in Bocagrande, Castillogrande, Laguito, San Diego, Getsemani and Santo Domingo, a pick-up service is offered at the hotel. Please indicate the name of the hotel of the passengers. Pick up service from 8:00 a.m.
You may cancel or modify your reservation (s) with a penalty of 10% of the value of the services, up to 24 hours prior to the provision of services. Upon expiration of the previous term, you will be charged for the total value of the reservation without the right to a refund. The services that are cancelled for reasons of majeure force (Adverse Weather Conditions - Order by Port Captaincy Party) will get a full refund without penalties. Note: In case of cancellation or refund, please ask the advisor for a copy of your request.